Positive Reinforcement « Positive Horsemanship. What would you do if your horse had a behavioural problem? Firstly check for any physical reasons for the behaviour – pain, ill-fitting tack, back problems, teeth, feet etc. Then check the environment is right for the horse – has he got friends, freedom and forage? Is he free from stress – e.g stabling for too long without enough forage can cause stress related problems such as gastric ulcers. Look at the diet, is he over fed for the amount of work he is doing? Then look at why he performs the behaviour, what is the purpose of the behaviour, is it a fear based behaviour, does he feel insecure, does he have separation anxiety etc. Often changing the environment will make a huge difference. Only then can a behaviour modification plan be formulated. Training alone may never get to the root cause of the problem, at best it may put a sticking plaster over the problem, by suppressing the behaviour. Yes you can train alternative behaviours to ones you don’t want, you can punish the behaviour e.g adding an aversive stimulus every time he performs the behaviour until he learns how to avoid the aversive and the behaviour stops. EG adding pressure to the halter every time he tries to run away. The use of aversive stimuli can either stop a behaviour (punish), or its removal can reinforce a behaviour. So are you punishing the running away or reinforcing the stopping? Get professional help from an equine behaviourist well versed in the correct use of positive reinforcement. Behaviourists will need veterinary approval first – this is to rule out any physical cause of the behaviour. Find one who can teach you to use systematic desensitisation and counter conditioning. This will change the emotions associated with fearful situations. Horses are big, strong animals and we do need to stay safe but that does not have to mean using pressure halters or other controlling equipment. 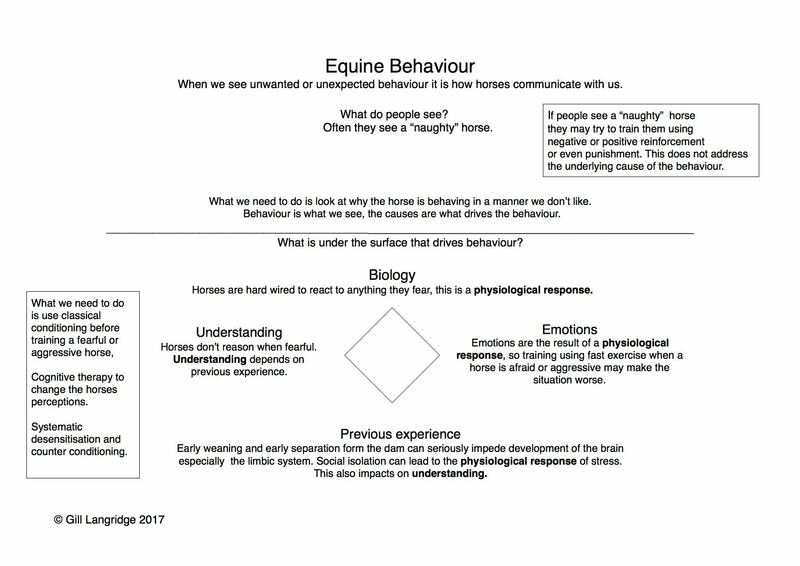 They may work as the horse learns to avoid the pressure but without examining the underlying cause of the problem it may reappear later. Suppressed behaviours do have a habit of spontaneous recovery. Horses need to feel safe, our relationships should be built on mutual trust. Mojo fidgeted a bit having the saddle on and then didn’t want the bridle at first. After some investigation and some reinforcement for touching he put his nose in the bridle. He was very good going from cone to cone over the poles though. We didn’t do any training at the mounting block as I didn’t feel he was in the right mood today. I just couldn’t find his scratchy bits today. This is low res video as there seems to be problems uploading large ones to You Tube.